At Budget Blinds of Spokane Valley, we're your local neighborhood experts that truly understand your needs. We're in your neighborhood, we know the local Spokane Valley weather and community, and we’re backed by the #1 provider of blinds, shades, and drapes in North America. Over 25 years of customer satisfaction gives you peace of mind that only comes with choosing the proven leader. We bring the showroom to you in Spokane Valley. We expertly measure your space, install beautiful window treatments, and back it up with the best warranty in the business so you can sit back and relax in the beautiful, Spokane Valley weather and sunshine. We serve to give you the best in window treatments, so you can rest easy knowing your space will be beautified and optimized with window treatments that fit your individual needs. If you're looking for blinds in Spokane, look no further than Budget Blinds of Spokane, Washington. We are the leading full-service resource in the land of Hoopfest, Gonzaga University, and Riverfront Park for fashion-forward window treatments. As a locally-based, family-owned business that's active and supportive in our community, we pour our heart and soul into brightening your windows and your day. 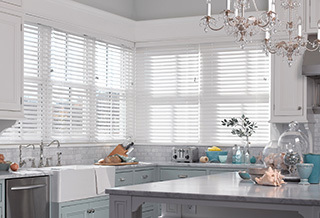 From versatile blinds to elegant shades and drapery, to feature-rich, artisan-inspired shutters, our brand of superior "window therapy" will make you wish you'd called us sooner. Great experience from the initial consultation with Jason to the installation with Carl. We weren't sure what we wanted and Jason was patient and showed us many different options until we were confident in our choice of blinds. We were able to match our wood trim perfectly. Carl, the installer showed us how to use them properly. Very pleased! Will definitely recommend this company to anyone looking for blinds. Great guarantee also. Jason is an expert! His knowledge of product and wisdom really helped us make an excellent decision on our window treatments. He didn't feel like a pushy salesman and was so patient with us. We bought 4 windows 3 years ago and just got 12 more installed today. Carl the installer is the best in the business! His attention to detail I really appreciated, he installed it like it was his house. He took the extra time to make sure it was perfect and provided exceptional customer service. I would recommend Budget Blinds Spokane Valley to ANYONE! We are very impressed with the quality of our shutters and the installation process was excellent. Highly recommend Budget Blinds.